With some organizations and individuals encountering significant changes to their health insurance costs and plans in 2014, the following metrics provide benchmarks on how organizations in Northeast Ohio have structured their health insurance plans and how much these plans are costing both employers and employees. Although the needs of each organization vary, understanding how these benefits are being delivered to employees and at what price can help organizations gauge how competitive their benefits offerings are compared to other organizations in the region. 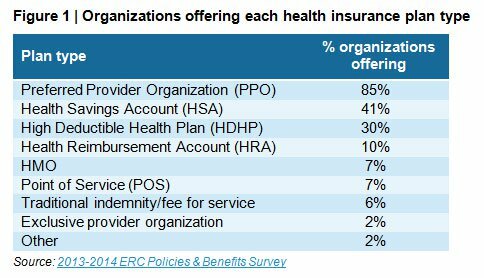 As the figure below illustrates, the most common type of health insurance plans offered are Preferred Provider Organization (PPO), Health Savings Accounts (HSA) and High Deductible Health Plans (HDHP). In terms of controlling and sharing costs, HSAs have been experiencing the strongest growth in popularity. Many organizations have turned to HSAs as a way to better fit the financial and health related needs of certain employee groups. Although the numbers vary somewhat from those reported in the table below, according to ERC’s 2013 Workplace Practices survey, the number of organizations offering HSAs has jumped by nearly 30% over the past 10 years. 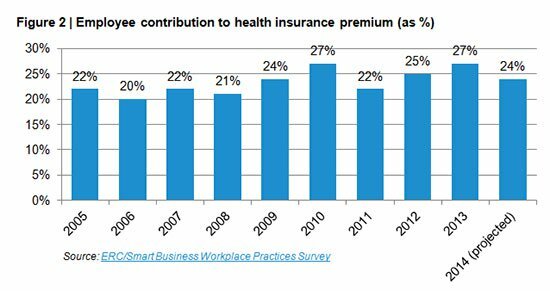 The average percent of health insurance premium that employers plan to contribute in 2014 is 76% which leaves employees with 24%. This division of costs has remained fairly consistent over the past several years, moving up or down just a few percentage points from year to year. At the time the 2013 ERC Wellness Practices Survey was published, one-quarter of participating employers indicated they would be increasing the percentage their employees must contribute to the health insurance premium in 2014. Slightly fewer organizations reported increasing deductibles (21%) than premiums overall, while even fewer increased prescription (10%) or primary care copays (9%) for 2014. Nearly half of employers (48%) indicate they did not increase any of the employee healthcare costs included in the Wellness Practices Survey. However, when increases were made, they tended to be large percentages. For example, specialist visit copays and annual deductibles saw the largest percentage increases at 70% and 65% respectively. Even with cost savings or sharing measures in place, the reality is that providing quality, reasonably priced healthcare to employees is a benefit that top talent (and even not so top-talent) are seeking from their employer. To see where your organization’s total healthcare costs stack up in comparison to 102 other Northeast Ohio organizations see the table with industry breakouts below.